#TokuTuesday -- Power Rangers Dino Charge Trailer! 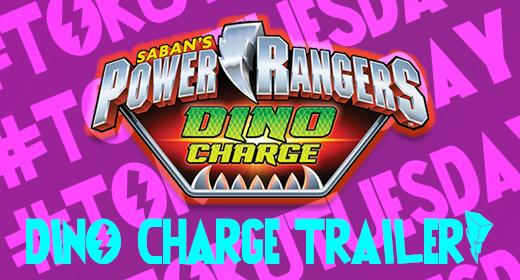 Toku Tuesday is back with a trailer from the Dino Charge season! A while back I reported about the newest entry into the long running franchise of Power Rangers, Dino Charge. Well we have already had a small teaser released, but now — courtesy of Amazon, no less — we have a more extended trailer for the new season! We even have a look at the official theme song. To me it sounds similar to one of Pacific Rim’s OST songs with some new lyrics. So — after four years of ‘Go Go Power Rangers’ redone again and again, we get something a little more refreshed. If that’s an indicator of what this season has to offer, then we are off to a great start! Both videos courtesy of @RangerCrew on YouTube. Sounds like a good theme to get you pumped, doesn’t it? I love the instrumental music to it and can’t wait to see it in action, or — well, behind the action in a fight scene. What do you think about the new trailer and theme? Do you plan to watch Dino Charge? What are your hopes for it? As always, let us know over at JustUsGeeks.com, and for any Toku questions you may have, tweet me @animeredneck96! Be sure to check your local stores as well for #ChargedUp toys in the coming weeks!